So, this book interested me for a variety of reasons, not least of them the fact that the author Richard Ford entered and won a contest to narrate a Broken Empire/Jorg short story for me:https://www.goodreads.com/book/show/1... (text & audio free to download)He did a great job with it too.I'd seen a range of reviews for Herald of the Storm, some full of praise, some with complaints, but all of them intriguing.Now that I'm done I find myself wanting to compare the story and style to other authors I've read. I think Malice by John Gwynne would be the closest match, with elements of Michael Sullivan's Ryria and even a splash of Jeff Salyards' Scourge of the Betrayer.It's a book with many point-of-view characters (8 I think) each commanding their own chapters, and between them covering many angles on a wide ranging event (an invading army that we don't get to see, and the large capital city that they're closing in on). In addition to comparing it in style and scale to Malice I could compare both to A Game of Thrones in that respect.Ford gives us view points from beggar child to heir to the throne, and all stops in between. The first 8 chapters belong to 8 separate characters, so there's a steep learning curve and it's a while before you get to revisit anyone. This approach may be forced upon Ford by his attempt to fit a George RR Martin's weight of story into a Prince of Thorns length (well, not quite that short) book. It does mean though that the start is a little rough with considerable amounts of plot/background information being fed to us, sometimes in 'as we both know' conversations.Things smooth out as you get into the meat of the book and readers will find themselves selecting favorite characters whose chapters they most want to read.It's possible to map most of these characters onto standard 'trope' figures, but that's perhaps unfair since even the most cliched character can be made fascinating by good writing and even the most promising and original character can be killed with bad prose. Ford hits a lot of good notes and sets up a major conflict for book 2 that should be very exciting having had all this groundwork laid to establish the characters inside the city.I can see now that both the people who rave about the book, and the people who had reservations, have a case. Ultimately it will come down to your personal reading tastes and where they lie on issues of scale, detail, pace etc.For some this will be too much story squeezed into too small a space, for others it will be bursting at the seams with drama, excitement, and imagination.I found plenty to like and would be interested to see what Ford could achieve with a truly Martinian page count!Join my 3-emails-a-year newsletter #prizes..
Love this book. But then I wrote it, so I would wouldn't I. Wouldn't I? Great start. Lots of characters and storylines being introduced so you need to approach this as the beginning of a series. If you are looking for a satisfactory ending or compartmentalized book-book series, this is definitely not for you.With that said, the writing is great and the aforementioned becomes a "pro" if you like a vast landscape with lots of characters, storylines and world-building. The good thing is that the 2nd book is out and you don't have to wait.Worth a shot for any fan of fantasy. Originally reviewed here: http://thequeenofblades.blogspot.co.u...I'll admit I was not expecting much. I just happened to be on the library website renewing something else, when I saw this. It happened to have been on my to-read list. I happened to have succumbed in a moment of weakness. I have a virtual pile waiting for my attention. I was, under no circumstances, to request any more books - from anywhere. Of course, I came away with three orders! I'm weak.I was only about 7 or 8 chapters in when I realized this would be quite the ride. The cast of PoV's is huge. There's eight of 'em. Eight. Its only a 392 page book! Now you might think that causes it to feel a little thin on details. Not the case. The world building was limited, but I never noticed until after I finished reading the whole book. The characters are totally central to the plot and they are so well written I didn't miss the particulars one background filler's coat or the finer details of Janessa's palatial home.This character driven writing is great, it's a tried and tested way to get the reader to focus on the cast and consequently care about them. It works really well. I cared. I cared a lot. Which makes me wonder why this book is so under rated? It truly deserves a better standing.The plot was just as great. Through the various cast members we get to see the inner workings of the city. Some of them cross paths, some don't, all play a vital role. I struggled to pick a favourite. They are all so brilliantly written! If I had to I'd probably go with Nobul. I'm a sucker for broken war veterans. Although Waylian was also great, as was Merrick. I suppose they all have one thing in common. Their failures. Nobul is a failure as a father. Waylian is a failure as an apprentice, and Merrick simply a failure as a man.As we near the end everything comes together in a hugely satisfying climax, with all of the characters facing a choice of who they wish to be. Wolf or shepherd, as it were. Strong debut that makes the series look very promising. Writing 4/5Imagination 4/5Plot 4/5Setting 3.5/5Characters 4/5Grimdark 4.5/5My Overall Enjoyment 4.5/5I wish I stuck with this last year because it's great. After a bit of a slow start, which was why I set it aside last year, the different story-lines really hooked me and I found myself anxiously turning pages awaiting what happens next. I think there are 5 main characters, and with the exception of one of them, which was well done just not for me, I enjoyed them all immensely which is rare for me. Even in ASoIaF, I might like half the viewpoint characters and could just as soon leave the rest. I most enjoyed the apprentice magicker Waylian because through him we learn a lot about the history of the world and how magic has played a part. The scene with the Archmages was one of my favorites and it included my other favorite character, the "herald" who was really mysterious but had too few scenes. I would be interested in learning more about him. Overall pretty grim world and characters, excellently written actions scenes, some unexpected twists, characters you thought might become good that didn't and ones you thought wouldn't did, and all of the characters threads converged to a believable and satisfying conclusion while setting up for what I hope will be a long series. The worldbuiding was good, just right for a reader who doesn't want to invest a huge chunk of time learning religions, factions, tribes, etc in yet another epic tome, as was the magic system, which I enjoyed exploring. This book has a sword and sorcery feel to me, less emphasis on the world and more on the characters, not at all to say the former was lacking, but it seemed pretty character driven. The writing is great and I flew through this book, it was very fun and easy to read. Great character and place names which always increases my reading enjoyment. This is the third time this year that giving a book a second try has paid off huge. The second book in this series comes out later this year, The Shattered Crown and I can't wait to read more Richard Ford!Highly recommended! If the first few chapters seem a little slow, don't give up. It is well worth sticking with it for this excellent book. Grimdark readers should enjoy this book. It is a bit less grimdark than some others so those new to the genre should enjoy but it also has the brutalness that typifies the genre. Great book. A character-driven tale of a city facing approaching turmoil. I enjoyed all of the characters and loved how they interacted as the plots mingled. A must read. Read the full review here - http://wildersbookreview.blogspot.co....Herald of the Storm takes the fundamental parts of gritty, epic fantasy and puts the focus on character first. It’s filled with big personalities that each have their own stake in keeping the city of Steelhaven safe from the constant threat of war. The lack of any cohesive plot throughout the novel may be an issue for some, but this is the story of one city in a vast fantasy world. It’s testament to Ford’s world building skills that although we never leave the city of Steelhaven, we do get the sense that outside its walls is a whole world, just ready for exploring. If you love the works of Joe Abercrombie or even George R.R. Martin you will probably find something to enjoy in Steelhaven – it’s violent, vicious and darkly funny. Book Two can’t come fast enough - bring it on. Bienvenidos a Steelhaven... El Heraldo de la Tormenta es el inicio de la trilogía Steelhaven y por lo tanto nos introduce en su mundo, presentandonos a diferentes personajes, conociendo a los buenos y a los malos, viendo cómo funciona el reino; logras entender quién es cada uno y cómo piensan verdaderamente.Después de un comienzo lento, ya que me costó meterme en la trama porque se presentan muchos personajes con diferentes roles; tenía miedo de que fuera una lectura pesada. Afortunadamente a medida que pasan las páginas la historia toma ritmo y me encontré ansiosa por saber qué iba a pasar.Al principio conocemos a 7 personajes que parecen tener 7 historias diferentes, pero luego gradualmente, vemos cómo sus vidas se entrelazan y comparten situaciones. Estos personajes nos brindan diferentes perspectivas y vemos por sus ojos qué esta pasando y cómo es la ciudad de Steelhaven. Personajes como la heredera del trono, un mercenario caradura, un asesino con remordimientos de consciencia, un aprendiz mago, una joven ladrona, una monja guerrera... Esto me gustó muchísimo, cada personaje está muy bien construido, cada uno con su propia personalidad inconfundible. Tiene muy buenos personajes femeninos: fuertes, decididas y con importantes roles. Y lo mejor es que todos logran crecer en el transcurso del libro.La trama engancha y la narrativa no es complicada, está muy bien escrito: con descripciones y detalles, con capítulos cortos dónde pasan cosas concretas y te mantiene con ganas de saber más.Un libro para los amantes de la fantasía, intenso, lleno de aventuras y acción, situado en un mundo fantástico con asesinos, magia, guerreros, malos, mafia...Un libro que te mantiene con intriga y tensión, con toques de violencia y humor dónde es necesario. Sin dudas, un buen inicio de saga que me tiene ya esperando su continuación! I am going to write a short review for this one, basically because it is a primer for the rest to the series. This book is all about building the world, introducing the main characters and hinting at the bad guys. For 60% of the book, not a lot happens, but you do really get to understand who everyone is and in a lot of cases, how they are linked. Normally with nothing much happening, I would get bored, but there is enough there to keep you turning pages. Then as we hit the back part of the story, the intensity increases and a really good story starts to develop. I am going to give this 3.5 out of 5, but I am leaping straight into book 2, which I have HIGH hopes for. Finished, ok another first time author who shows very good signs of great reads to come.The book is very slow but its worth the time you put into it. The action really comes in, in the last 70 pages of the book.It contains some very good female characters in main roles in the story. Comparisons to other authors can sometimes hurt a book rather than help it. One of the main parallels that have been drawn here is between Ford’s work and that of George R R Martin (indeed, it seems rare nowadays for a fantasy novel to escape the inevitable comparisons with ol’ GRRM), but aside from the structure of the novel (alternating chapters from differing points of view) and maybe a bit of the grittiness I wouldn’t personally make this comparison, partly because ASoIaF is something of a sweeping epic, while Herald of the Storm is concerned (for the moment) entirely with the events within a single city.That the entire story is contained within the city of Steelhaven is actually, for me, the book’s strongest point. The plot is fairly tight and pacy, and the ways in which several of the individual storylines were eventually interwoven was nicely done. There are two or three main plotlines occurring at the same time – an illegal slave-trading operation, a royal assassination attempt, and an act of dark magic – and it’s interesting to see how different characters are involved in each plot, and how each mini-plot becomes relevant to the bigger picture. In fact, the whole book does a nice job of laying the groundwork for the next one in the series.I enjoyed the diversity of the characters: there’s Kaira Stormfall, morally upright Shieldmaiden of the goddess Vorena; Janessa Mastragall, innocent and headstrong heir to the throne; River, an assassin with a conflicted soul; Merrick Ryder, a former duellist and dandy who has fallen on hard times; Rag, a street urchin and pickpocket; Nobul Jacks, soldier-turned blacksmith-turned city guard; and Waylian Grimm, apprentice in the tower of magick (no, I’m not sure why it has to be spelt with a ‘k’ either). Although there are a fair amount of characters, the variety between them helps to keep it interesting and make it work.Despite not being a huge fan of the structural style (namely the use of alternating PoV chapters) I did enjoy the way the author used this to keep certain things, such as the identity of certain characters, hidden until key moments. He uses the alternating chapters to gradually reveal the connections between different characters, and to show the impact of other characters’ decisions on others’ lives. I did feel that certain characters’ storylines felt a little out of place – Rag’s story came to feel a bit irrelevant, and Waylian (and magick in general) also seemed a bit like it had been shoe-horned in there. However, the final chapters for these characters do seem to suggest that both will play a larger role in future novels.A quick point about the language: I don’t usually have a problem with the use of profanity in fiction, provided that the use of language fits with the character of the person who’s saying it. However, the author has created several less-than-golden characters here, many of whom swear frequently; and although it fits the tone of the novel, which is dark and gritty, it does sometimes reach a point where the constant repetition of ‘f**k’ and ‘s**t’ becomes a bit tiresome. I mentioned the popular use of GRRM as a benchmark for modern fantasy novels, this one included, but the fact is I bought this book on the strength of numerous comparisons with Joe Abercrombie (another of my favourite fantasy authors). While I can certainly see the similarities – character-driven storytelling, grimy characters, dirty deeds – I think this is another case of hurting a book by comparing it to another of a very high standard. Ford’s characters didn’t quite spring to life for me in the same way as those in, say, the First Law trilogy, and I didn’t feel as sympathetic towards any of them as I did towards those in Abercrombie’s books. If I hadn’t heard any of the glowing comparisons (one blog even raved that Herald of the Storm was actually much better than First Law) then I probably wouldn’t even have noticed, but as it is I couldn’t help being just a tiny bit disappointed. However, I enjoyed the story, the characters grew on me, and I look forward to reading the next in the Steelhaven series when it’s released later this year. 'Welcome to Steelhaven', says the blurb, and it’s the city that ties the characters together. 7 characters, 7 disparate stories - or so it seems at first. Gradually, these lives begin to mesh and weave together, as you know they must.The characters are the bread, butter and jam of the thing and they are really good. Each character is so well drawn: there’s never any confusion as to who each is, even when in disguise, even when (I think) there’s supposed to be ambiguity and a touch of surprise - there’s really is no surprise because everyone is so like themselves. The characterisation is that good.The story is not over-wrought or trying too hard to be 'epic'. It has the usual fantasy setting, Medievalish in tone, but there's a strong thread of realism, Steelhaven feels like a real place in a real time. There is magic, but it’s not high fantasy – in the sense there are no elves or dragons (thank goodness). This magic has mystery that is intricately woven into the plot, it’s not a device, a get out of jail card, the story is far more subtle than that. In short, this is a very finely crafted, excellently written, old-fashioned adventure yarn set in a gritty, realistic, fantasy world, and the whole thing driven by the best set of characters I’ve read all year. Excellent stuff and highly recommended. A bloody romp through a criminal underworld and a story that uses a deceptive simplicity to bring the characters to the fore. After a slightly off-putting start where the first eight chapters introduce a new POV character the story settles down and begins to weave the various tales of Steelhaven's population as the threat of a ravening horde draws closer. Tales of cutpurses and assassins aren't really my thing, I'd have preferred to have a few of the POVs out with the army, but Ford instils a good amount of humanity into each. I realise one of the things that bugged me about the switches early on was that he'd built each one pretty well in their first chapter then jumped away from them. The plots interweave naturally and there's a good balance to it all, so while I never got a huge sense of where the main drive of the series is, I enjoyed the ride greatly and expect things will crank up a notch in the next book, most likely to more of a wider-scale epic style that's even more my bag. Bloody good, gritty and engaging. Epic fantasy is my first love and even if I've since broadened my scope and fallen in love with other subgenres, a good epic tale will always catch my eye. The description for Richard Ford's Herald of the Storm in Headline's spring catalogue certainly jumped out at me and I was really pleased to be sent an ARC earlier this year. I'd read Ford's previous novel Kultus last year and while I had some issues with it – largely due to some really foul language and some uneven world building – I really enjoyed it, so I was looking forward to seeing how Ford would take on epic fantasy. And I have to say, I really liked Herald of the Storm. There were some elements that didn't completely work for me, but Ford's clearly grown as a writer and Herald of the Storm is a totally different sort of book than Kultus was.Ford tells his story through the viewpoint of seven different characters, with each chapter being told from one character's point of view. Now, I like multiple viewpoint epics quite a lot, but they are quite difficult to pull off and there's a risk the reader might not connect strongly or at all to some of the main characters. In addition, sometimes it makes the story jump arcs so many times that the narrative loses its flow. For me, Herald of the Storm suffered mostly from the latter of these issues, though I did have favourites among the main characters. It takes quite a while before some of these characters pair up, which means that there are seven storylines to follow and whenever one got really moving, we'd get to the next chapter and jump to another character, not knowing when we'd return to the one we just left. This frustrated me as it disturbed the flow of the narrative and I found myself leafing ahead to figure out how much I'd have to read to get to the next chapter for the character we'd just left behind. However, all the storylines felt necessary to the plot, bar two, Rag's and River's, but I think they might be more pivotal in the next book in the series. Why do I say they didn't feel as crucial to the plot as the rest? Because I felt that a number of the impacts they have on the story, mostly through impact on other main characters, might have been accomplished in the story through other means and not changed the story that significantly. But, again, seeing where they end up at the end of the novel, I can see them having far more impacting roles in the next book. However, I did enjoy both of these characters, so I wouldn't have wanted to miss them either.The protagonists cover all the different strata of life found in the city of Steelhaven. We see the criminal underbelly of the city represented by Rag, River, and Merrick; the working class represented by Nobul; the ecclesiastics represented by Kaira; the scholars represented by Waylian; and the nobility represented by Janessa. This allows us to get to know the city's populace in all walks of life and see how they regard the others, even if in the main they don't consciously cross each other's paths. My favourites were Nobul, Waylian, Kaira, and Merrick. I found them and their arcs most compelling. Nobul is a veteran of the country's bloodiest battle, Bakhaus Gate, which had him see horrors he's never forgotten and left him a changed man. It also meant he wasn't the husband and father he should have been, which drives him to leave behind his life as a smith and join the city watch, the Greencoats. Through Nobul, we get to see the darker side of Steelhaven and how powerless the militia feels and how corrupts many of its members are. I appreciated Nobul's awareness of his vicious streak and his genuine grief and guilt at his treatment of his son. Ford makes him sympathetic but with a dangerous edge and a character that is on the way to redemption which is always an enjoyable thing. Waylian, on the other hand, doesn't need redemption, as he's largely an innocent. A young student at the Towers of Magisters, he's feeling out of his depth and lonely and is on the point of giving up. His is a traditional epic fantasy character trope, that of the young man that discovers his place in life among the doings of the great and powerful. I'm a sucker for the trope, so it's no surprise I liked Waylian, but I liked Ford's treatment of him, taking him to the depths of despair and leaving him more confident, but still unsettled in his new position. Kaira, the Shieldmaiden of Vorenna, is trained as a warrior and is magnificent with a blade, but she is given an assignment that will test her and her allegiance to the Temple to the limits. I liked her a lot and especially once she is paired up with Merrick, their chapters became some of my favourites. The interaction between these two was priceless; Kaira not quite sure what to make of the rake Merrick and Merrick completely stymied by the fact Kaira is rather unreceptive to his legendary charms. There is a lot of humour there. Both Merrick and Kaira go through a lot of change and face many demands on their conscience throughout the book and where they end up at the end of the book was really cool and I can't wait to find out where they go from here.The only character I found somewhat disappointing, was Janessa. Her storyline was interesting and there was some interesting politicking going on, but much of her story arc deals with her need to marry to be able to rule country. While in the end, Ford sets this stereotype on its ear and in a rather splendid way, there were some elements to Janessa's actions, mostly those to do with her secret love that annoyed me. She only seemed spurred to action because of this man's actions and I thought she showed more potential than that. A far stronger female character, besides Kaira, was Waylian's mentor was Gelredida. She is a powerful mage, who treats herself as an equal to the men around her and doesn't let them dismiss her out of hand for being a woman. Overall, there were some lovely secondary characters in the book and Ford manages to give most of them – with the exception of the many thugs and henchmen our characters encounter, because how much personality does it take to read goon – a distinct personality.Despite being a true epic fantasy, there are several different flavours to the plot. There's a murder mystery, a heist, a budding partnership between a swindler and a Temple Shieldmaiden, which at times resembles a buddy comedy, all mixed in with your regular political intrigue and warfare sporting epic fantasy. Ford's world-building has improved. It's far more even and while similar to Kultus the narrative is largely confined to one city, we do get a bigger picture of the world beyond. Setting my issues with pacing and some of the characters aside, I really enjoyed Herald of the Storm. With only a hundred pages to go, I had to force myself to put the book down because I'd have wanted to finish it otherwise and I really needed to get some sleep. The book is a somewhat slow starter, but it burns brightly once it's out of the gate. Ford has created a really solid first epic fantasy novel and I'm looking forward to reuniting with our protagonists to see where Ford takes them next. If you're looking for some big epic fantasy to lose yourself in over the summer, Herald of the Storm is a good place to start.This book was provided for review by the publisher. Ако знаех, че когато си купих книгата само заради корицата, че ще уцеля толкова приятна за четене книга, то щях да пусна тото – явно късметът е бил с мен този ден. „Вестителят на бурята“ е непретенциозно (засега) начало на една поредица за Стийлхейвън, чието мото е „Добре дошли в Стийлхейвън...Пазате си гърба!“. Ричард Форд е едва прохождащ автор, но вярвам ,че с времето ще надмине всички очаквания – светът на Стийлхейвън е богато и наситено описан, героите са плътни и разгръщащи се с всяка следваща глава, а най-доброто – сюжетната линия е стабилна и се разгръща в течение на цялата книга без осезаемо забавяне. Героите са много и се навързват перфектно с течение на повествованието (е, не всички, но определено се загатва много сериозно за останалите). Друго, което ми направи изключително приятно впечатление, е пъстротата на действието. До голяма степен книгата ми напомни по стил на Брандън Сандерсън след като дописа Колелото. Сюжетните линии са много: принцеса, която е изправена пред тежки решения; убиец, нает да убие принцесата; пропил се благородник в немилост, който сключва сделки за роби; Щитоноска-воин, която трябва да пази благородника, отказвайки се от познатия й досега живот; млада джебчийка, изправена пред трудността да си извоюва място в Гилдията; бивш войник-ветеран, сега ковач, който се завръща към корените си и се изправя пред моралната дилема дали да убие убиецът на сина си; чирак-магьосник, който открива, че силата може да се крие в най-странните места. И това са само главните герои. Второстепенните герои са безброй много и изпълняват заложените си цели перфектно. А в целият този хаос от север настъпват хуртите с безжалостния си принц и адски бойни хрътки, които искат да завладеят Стийлхейвън. Споменах ли, че сюжетът е богат на действия и няма опасност да доскучае?Въпреки че в началото ми беше малко трудно да следвам всички герои и случващото се с тях, то след средата не можех да я оставя, толкова ми беше интересна.Стийлхейвън е свят, изпълнен с опасности, но и богат на приключения. Макар да не е от класът на Стивън Ериксън по богатство, то определено на всеки, който харесва Брандън Сандерсън ще му допадне и Ричард Форд, и неговите герои. Приятно за четене, не много леко четиво, но пък завладяващо.Трябва да отдам дължимото на Артлайн за качеството на изработка цялостно на книгата. Преводът е перфектен, корицата е невероятна, отделно, че е и hardcover (рядко срещано на пазара днешно време), не забелязах грешки в текста и споменах ли, че корицата е много добра! Поздравления на Стефан Вълканов за нея, а ако го познавах щях да го черпя една бира за невероятния талант, който има – корицата е всичко, което може да се иска за тази книга.А ако трябва да обобщя книгата с две думи: заповядайте в Стийлхейвън, за да може Ричард Форд да отвее всичките ви очаквания и след това да ви зашемети със свят, изпълнен с опасности и приключения, любов и омраза, сила и власт! И за да може да усетите полъха на задаващата се буря на хоризонта – буря, след която няма да оцеляване. It took me a little while to get into this, there are a lot of characters to get used to but then it all comes together rather nicely.Set in a capital city, everything is chucked into the mix that you can imagine from the genre. Assassins, magic, thieves guild, ganarled old warriors, female warriors, impending hoards of bad guys, slavers, court politics etc etc. But once you get used to the assault to your senses and remembering who is who, this is actually pretty good. The characters grow on you, the plot comes together and before you know it you are churning through the pages and are sad when you come to the end.First in a series (and an impressive debut I thought) and I am looking forward to the next one. Deslumbrante, cuando me dieron el libro y vi que mencionaron a Rothfuss y George RR Martin supe que venía algo bueno, aunque tenía miedo de que sus mundos épicos en cierta forma se parecieran, pero no, podría decir que he encontrado la prosa de Martin con el misterio de Rothfuss, pero sería quitarle mérito a Richard Ford, que sin duda se lo ha ganado, el heraldo de la tormenta es el inicio de la trilogía SteelHaven, en la que vamos a conocer la razón de ser de los personajes lo cual me parece perfecto, y la manera en que funciona el reino, encontraremos, magia, asesinos, soldados, mafia y mucho más!, no puedo esperar a la segunda parte. originally posted at: http://thebookplank.blogspot.com/2014...In the last few years the grimdark genre has been steadily on the rise slowly transforming the existing epic fantasy. Via a few authors I have gotten nicely acquainted with grimdark fantasy and have thoroughly enjoyed reading those stories. Herald of the Storm is Richard Ford's second book, where his debut Kultus was a steam-powered story, Herald of the Storm is a dark fantasy story, I haven't read Kultus but making a leap from steampunk into grimdark fantasy must be quite a task! 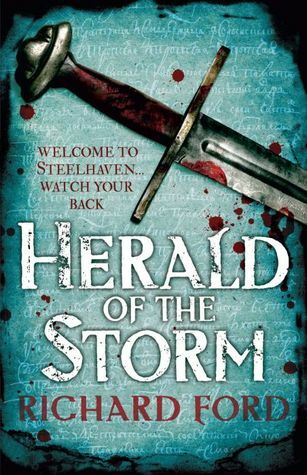 Herald of the Storm also kicks-off the fantasy new series: Steelhaven. The second book The Shattered Crown will be out next month from Headline.If you read the synopsis of Herald of the Storm you might think that this is a short straight forward story, well your wrong if you think that, there are about seven different kind of characters and separate storyline that you get to read. The introduction to Herald of the Storm lays the focus on one of the many different characters that you follow: Massoum Abbasi who is set to travel to the city of Steelhaven as an herald to discuss some important issues with King Cael. For me the book couldn't have had a better introduction, in this first part Richard Ford establishes a pretty strong storyline and help to put the dark essence of the storyline just right, featuring not only the possible outlines of the plot and that the warlord Amon Tugha has nasty things in store, but also a nice dose of action by a head to head fight. I don't know, it's hard to clearly describe but it definitely put a smile on my face! Soon afterwards you are steadily introduced to each different storyline and soon the book picks up more and more pace as the storylines start to alternate with the chapters and Richard Ford leaves several chapters on nice cliffhangers more than once really urging you on to read and finish this book asap. What does soon fall to note is that Richard Ford early on broadens the scope of the story, like I already mentioned above the synopsis is pretty straight forward and shows perhaps one direction. However there are a lot more, not only does the warlord Amon Tugha pose a threat, there is an uprising in the criminal circuit of Steelhaven and last but not least there is a great magical threat that could cause destruction of not only Steelhaven but the rest of the world as well... I was really pleased with how Richard Ford executed all these different idea's. You can clearly see that Richard Ford shows a lot of enthusiasm in writing Herald of the Storm, he shows you the ins and outs of all his idea's, but oftentimes bringing so much idea's to life in such a setting can put a drag on the story with information dumps. Luckily this isn't the case in Herald of the Storm, I think this was mostly owed to how it was done, with the multiple storyline. Here there is a clear separation in place and role and in one for example you get the complete lowdown on the criminal system and with another you learn about the magick system in Herald of the Storm. It's hard to give a short description of the story without revealing to much, so I will just jump to the most important past of the story and those are the different storylines that you follow along the way. Lets start with Nobul, a blacksmith going through a rough patch. This might be your typical guy just doing a job staying out of trouble, but with a past that haunts him daily. He has lost his wife to a disease that struck Steelhaven in the past and now is left alone to raise their son. Being an army veteran he wants nothing more than to forget his terrible deeds and find that putting all his effort in his blacksmithing helps him. However this focus plays a large part on his son, Nobul isn't able to connect with his son anymore and they often has fights. What does comes to show early on in Nobul's character is his that he is stricken with his deeds of the past and that he wishes daily that things never happened. This grief stricken personality, instead of coming over weak really made his character, especially with all the things happening later on in the book, he is set out with one goal. Revenge. A second one that you follow is the daugther of King Cael, Janessa, I always like it when I read fantasy with a little courtly intrigue and problems associated with it. Though the focus in the beginning is more on the other stories, Janessa's part become more pronounced when devastating news hits the streets of Steelhaven. It's seems that her task and duty has been called into action but whether it will be an easy task.. I don't think so. A third one is by magick apprentice Waylian, now I really, really enjoyed reading his part, Yes I am a sucker for magic in fantasy. Waylian had everything working for him when he was still back home, but he has been called into apprenticeship to become a wizard, but find that the task of become acquianted with magick is much harder than it seems. He is being scolded by his teacher, Gelredida, but this does seem to have ulterior motives. Waylian's part isn't solely based on showing the magick system in Herald of the Storm, but there is much bigger threat on the rise that Gelredida and by happenstance Waylian are determined to find out. What they find in their investigation is much bigger than Gelredida would have dared to guess. What I liked about Waylian's part is that his chararacter grows and develops all throughout. It feels that he wasn't taking things seriously but all of a sudden he realizes this and BAM there you have a completely new Waylian! The fourth storyline is by Kiara. Kiara is a warrior known as a Shieldmaiden of Vorenna. In an earlier task she has caused quite a scene and now is left with the consequences and has to redeem herself, she is tasked with infiltrating the criminal underground. Kiara is shown as a very confident and determined lead, this again was a big plus, what you often see is that the males tend to overpower a story but Kiara puts them nicely into place. There is also something more going on between Kiara and another characters that makes up for an interesting continuation of the story in the sequel. As you can probably make up from the above mentioned characters, Herald of the Storm is a strongly character driven story. What often happens when you have so many different storylines is that some elements of the story might fall into the background such as development or depth or showing the world itself, but this isn´t the case at all. Like I said before Richard Ford nicely separates the story into different parts each taking place in different locations where you learn the ins and outs of them. Only later to have several storylines collide with each other to produces an even great feeling to the whole of the story. It starts to dawn that several earlier proposed individual events now might seem to be connected with each other. Richard Ford shows with Herald of the Storm that he knows his grimdark fantasy in the details. This strong character driven first book kicks off a new and interesting series that a lot of fans should be eager to follow along the way. Besides the strong characters that feature in Herald of the Storm there are plenty of twists and turns along the way as well as some pretty cool fighting scenes and lets not forget when the magick hits the scene full force. Herald of the Storm is chock-full of cool stuff! The sequel, The Shattered Crown, is out next month already be sure to catch up. Novela épica más que notable sazonada con esos toques grimdark que tanto nos gustan. Una vez pasado, aproximadamente, el primer cuarto del libro, en el que el autor se dedica a presentarnos al enorme elenco de personajes principales y secundarios de una forma demasiado evidente y directa, la cosa coge ritmo e interés. En parte porque la historia es divertida y engancha, pero sobre todo por lo que se va dejando caer aquí o allá; por lo que insinúa y por los derroteros que parece que va a coger en el segundo volumen.Desde luego, es una recomendación clara para todos los amantes de este género. RichardFord - Richard Ford originally hails from Leeds in the heartland of Yorkshire but now resides in Wiltshire, where he can now be found frolicking by the Thames, drinking cider and singing songs about combine harvesters.